Interlocutor: Is it science fiction what has been called “The Christ’s return" or "The second coming of Christ”? Johnakan Ur-El: All the messages must be interpreted with common sense. It’s been always said that the coming of the Master was related to an apocalyptic end, called also as “Judgement Day” and other things. You already know, for messages that we have given through the years that there is nothing like that. Then, it doesn't make sense that the Master embodies, because he is doing a great work from his spiritual plane. Besides, he has sent big brethren of his, as Jiddu Krishnamurti and to this same vessel who was previously John Zebedee and Ananda to give diverse teachings for the mankind of this time. Our brother Krishnamurti did it, so he has spoken in his works of human conditioning and now my vessel is bringing new paradigms. Interlocutor: There are some dates that have been named constantly as those of the “Return”, 2012, 2013 and 2014... Is there some special reason? 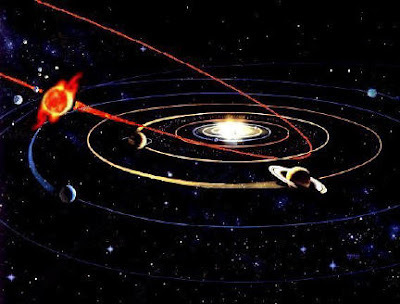 Johnakan Ur-El: It has been said, for example, about the existence of an asteroid that in the year 2019 will come closer to Earth, but we know that it won't pass close. There is one possibility of 250.000 that at least this asteroid even touches the surface of Earth. Interlocutor: Are we speaking of Hercolubus? Johnakan Ur-El: No, nothing like that. To Hercolubus they relate it to a black hole or a dark star. This asteroid I am referring to is a rock. Johnakan Ur-El: No it’s not that either. The Wormwood Star and Hercolubus are the same thing. All these things are nothing more than inventions. In the physical plane you use a word called "rumor." When somebody spreads a rumor it ends up rolling like a Snowball. Every time a millennium ends, they spread apocalyptic rumors that don't really have any firm fundament. Interlocutor: But the Wormwood Star has been mentioned in the Apocalypse of John! Johnakan Ur-El: The Wormwood Star or Hercolubus, which is the same thing as planet X, is a ET starcraft with the shape of a planetoid that has travel technology. Interlocutor: But at least it will produce some purifying effect? I mean to take out from people, for example, the mental poison, to say it somehow. Johnakan Ur-El: “Cleaner Effects” Do not exist. This is a total fantasy which is against the teachings of the Beings of Light like the Master Jesus as well as other higher entities, as The Essence, to whom I respect a lot. It’s been said that there will be changes of conscience that everyone is responsible for their own karma, their own destiny, according to their attitudes, to their works, to their will of growing and making grow others. It is necessary to emphasize that there is nothing that one could make to save certain people and not to other people. This would go against free will. Interlocutor: I believe that this is clear enough. Johnakan Ur-El: I insist that it’s very important to know that there is nothing external capable of helping us if we don't help ourselves. The Master Jesus already said it in a previous session: "Everyone will emerge by his own effort" I will give an example to conclude. In the physical plane we know that drug dependency exists, of tobacco, of alcohol and no addict can be helped by any therapist if they themselves are not aware that they have to help themselves. In the same way, in the evolutionary plane, Nothing external can sweeps suddenly away all the impures and only save to the good ones, this would be the same as taking away opportunities. We asked about the year 2012 to the Masters of Light and they answered us that in 2012 nothing will happen, but those who are convinced blindly that something is going to happen, later on, when they realize that nothing is happening, they will find a way to justify their wrong prediction, they’ll postpone it for 2014 or 2029 and so forth. There won’t be a “Judgement Day” either, because when we reach to The Big Crunch in 25.000 million years, all the spirits will be in the spiritual plane 5 and then, Why would be necessary a Final Judgement if all of us will be Masters of Light? This entry was posted at Sunday, May 17, 2009 and is filed under Science and Astronomy . You can follow any responses to this entry through the .